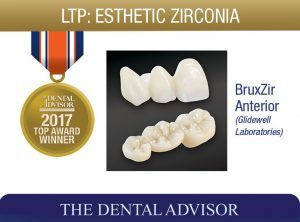 BruxZir Anterior is a highly esthetic zirconia designed to satisfy any patient’s esthetic needs. BruxZir Anterior has a flexural strength of 650 MPa with translucency and color similar to natural dentition. 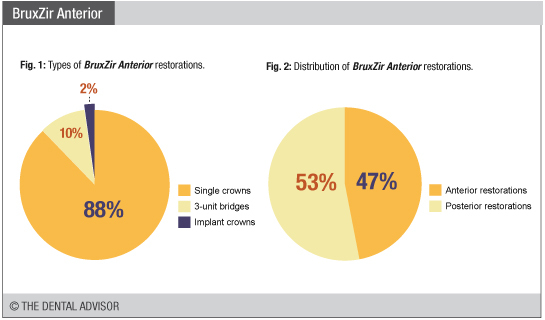 Because of its superior strength, BruxZir Anterior requires less tooth reduction than monolithic glass ceramic restorations and is kind to natural opposing dentition. Indications include single-unit crowns and three-unit bridges with one pontic as well as implant crowns. The high flexural strength of BruxZir Anterior allows the dentist to prepare teeth more conservatively without compromising the esthetic outcome – only 0.8 mm of reduction is required in most cases, although 1.25 mm is ideal. To date 306 restorations have been seated including: anterior and posterior single crowns, implant crowns and three-unit bridges (Figures 1 and 2). Of the posterior crowns, only 6% were 1st or 2nd molars, the remaining 94% were 1st and 2nd bicuspids. All restorations were prepared by Glidewell Laboratories. At placement, the restorations were evaluated in the following areas: esthetics, fit to tooth, marginal integrity, contacts, and occlusion on a 1-5 scale: 1=poor, 2=fair, 3=good, 4 = very good, 5=excellent. 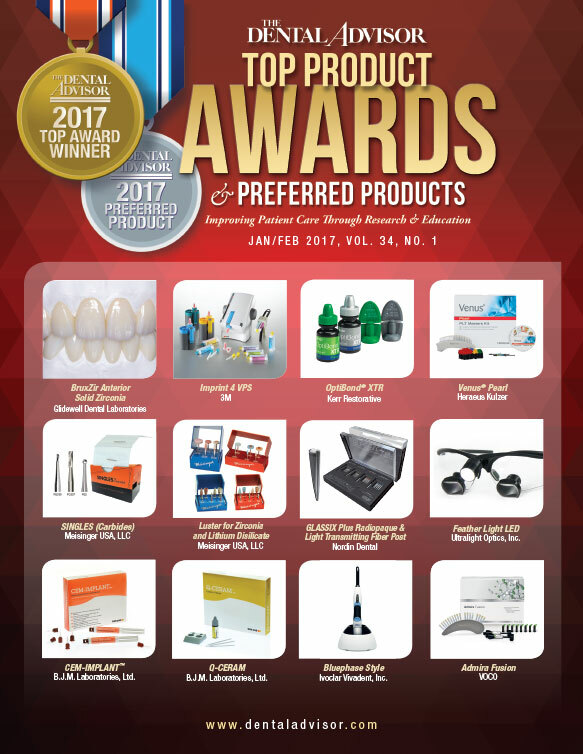 Ninety-six percent of restorations rated during placement for each of the above categories received a rating of 5 or excellent. Of the remaining 12 restorations (4%), the majority (8 restorations) received a rating of 4 while the remaining four restorations received a rating of 3. Two restorations were redone by the laboratory because the fit was loose and the contacts light. At placement, BruxZir Anterior received a 98% clinical rating. At approximately one year, about one third of the restorations (108) were recalled. 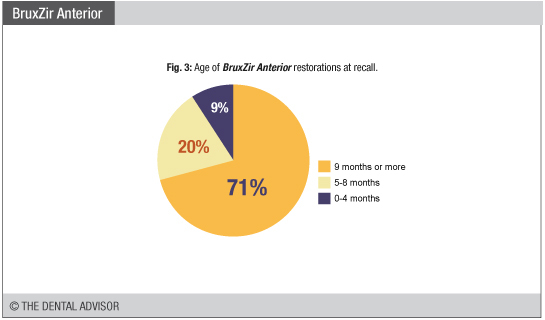 Of the recalled restorations, 71% had been in function for more than 9 months, 20% from 5-8 months and the remaining 9% less than 4 months (Figure 3). “Your teeth are beautiful, who did them?” (a comment a patient received after restoring teeth 5-12). 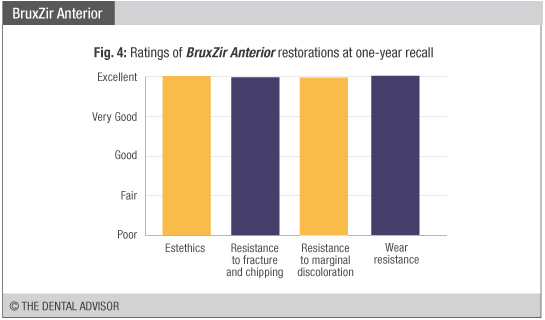 At one year with over 300 restorations seated, Bruxzir Anterior has performed exceptionally well in the area of esthetics, lack of fracture or chipping, lack of marginal discoloration, and wear resistance. It is highly recommended for use in anterior restorations and selected posterior restoration. Its flexural strength surpasses most silica-based ceramic materials available to the dental profession. At one-year recall, BruxZir Anterior received a clinical performance rating of 100%.